The Adam A5 is not an audiophile loudspeaker. Now before you died-in-the-wool audiophile-types stop reading, in perhaps a massive error of quick judgment, the Adam A5 recording studio monitor is so good that every audiophile should go right out and hear these amazing units. Longstanding readers of my reviews know that when i make a statement as bold as this so early within a review it can only mean you are about to learn about a truly outstanding product. So yes i will boldly say, perhaps in defiance at possibly insulting some readers, that this is not an audiophile product and that every audiophile should take note of the Adam A5 in a big way! Perhaps it is time to get audiophiles off their painted pony gear and enjoy another way of listening to their prized music collection. Specifically, for you to 'listen' in the same manner professional recording studio engineers create music to make a living (or at least squeak by on the meager paycheck provided by the major record labels). If you are seeking the truth, my ears tell me that the Adam A5, priced at a humble $699 per pair in matte black finish or $769 in glossy white or black, offers an amazing value. What you will not get is Harbeth-like LS3/5 fake bass extension by boosting the midbass, you will not get that silky dome tweeter smoothed highs, and you most certainly will not get any resemblance of deep bass below the truthfully specified 55Hz (± 3 dB). You can forget about the fabled Western Electric 300B rose-colored glasses, the faking of pinpoint imaging tricks by boosting of the frequency response within the upper midrange frequencies. Lastly, there is no way for you to easily remove the built-in amplifiers to insert your flavor-of-the-month club amplifier. In fact there is no need for a preamplifier either, as you can simply plug in your source component and enjoy the music (plug and play). The audioengine A2 (reviewed here) does not stand a chance in comparison and the larger audioengine A5 (reviewed here) got relegated back to their packing boxed and are now located deep inside my attic. You audiophiles know what i mean, that place in your home where 'dead' gear goes until you either finally sell it or, better still, give it away to a relative as a reboxed gift. The first time i saw the Adam A5 recording studio monitors was at the 2008 High End Society show in Munich. This must-attend event, apparently largely ignored by many America-based high-end companies, is where many millions of dollars of business each year comes to light. Both members of the press and the public at large get to see and hear a staggering array of excellent products. Among the new products launch at the show was Adam's A5, and as a studio musician in a earlier life it was obvious there was something very special going on here. So i immediately asked for a review pair and what you are about to read is the outcome. So what makes the Adam A5 so good? Ok, a play on words there as the "sum of the parts," or perhaps i mean "some of the parts"? It matters not as the smallest model within the Adam Studio Monitors follows their successful larger brother, the A7. The A5 uses the same proprietary Accelerating Ribbon Technology (ART) tweeter and the same type of woofer, consisting of a sandwich construction carbon fiber and Rohacell yet in a reduced 5.5-inch cone. Each cabinet has a pair of 25 Watt amplifiers, one each for the tweeter and woofer. While the woofer is quite interesting, i'd like to focus on the ART tweeter. Adam has plenty of technical information and there is no need for me to retype the obvious. So here are some of the basics, "The ART (Accelerating Ribbon Technology) tweeters units take a completely new approach in kinematics to move air and improve the quality of music reproduction. Based on the original works of Dr. Oskar Heil, who invented his "Air Motion Transformer" back in 1972, new electroacoustic transducers have been developed that are based on improved layouts and new materials. The membrane consists of a lamella like folded diaphragm whose single folds move according to the alternate current, thus squeezing air in and out. All other loudspeaker drive units, whether they are voice coil driven, electrostatics, piezos or magnetostatics, act like a piston, moving air in a 1:1 ratio. This is undesirable, as the specific weight of air is much lower than that of the driving mechanics. Speaking in terms of electrical Engineering one could say there is a bad match between source and load. The ART principle achieves a 4:1 velocity transformation between driving diaphragm and driven air, i. e. the air moves in and out four times faster than the folds itself are moving. This superior "motor" is responsible for the enormous clarity and transient reproduction that is to be heard from the ART drive units." "Besides the transformation advantage the construction of the membrane in single stripes avoids the typical break up of stiff domes or cones at higher frequencies and the resultant dynamic limiting. Another factor in dynamics is diaphragm area. What you see is what you get. The cone area you can see is always the acoustically active area of the loudspeaker - this is true for practically all other drive units. By folding the ART diaphragm into the third dimension as seen from the listener's position a much larger folio can be used. A factor of more than 2.5 can be seen between the sound generating area and the acoustically effective area of the diaphragm. Thus a smaller movement is needed for a given sound pressure level, enabling the unit to reach a higher sound pressure level without dynamic compression." To learn more, see Adam Audio's website plus Enjoy the Music.com has reviewed Oskar Heil's Kithara (reviewed here) and Harmonious loudspeaker (click here). Unlike most audiophile loudspeakers, the rear side of the Adam A5 has a panel with numerous adjustments to adapt the loudspeaker to the specific room acoustics or personal preferences. The tweeter level can be adjusted ± 4dB, the "Room EQ" at >6kHz of ±6dB and <150Hz of ±6dB. There are both balanced (XLR) and unbalanced (RCA) inputs to ensure connectivity to virtually any application in professional studios or at home. While each powered monitor has a volume adjustment knob, Adam provided a special Stereo-link feature. 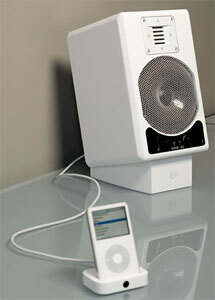 This allows users to adjust the volume of both loudspeakers with only one control to ensure a balanced volume level. The A5 is offered in flat black or high quality piano finishes (black and white). Adam also sent me a pair of their desktop/table stands that angles the speaker, yet they were not employed within this review as i have my own type of stand so that the loudspeaker height it at the optimum level. While many users could place the speakers on a table, thereby causing early sound reflections (time distortion) as the sound 'bounces' off the table surface, i use a wood shelf that brings the speakers up to the desired height. Speaking of which, i found the best sound to be when the woofer's top mounting bolt was at ear level. It has been a few years since my ears have enjoyed great ribbon-like tweeters. Have owned the then new Infinity RS6000, then tried the RS IIB (with audiophile tweaks)... and finally the Magnepan MG 3.6. Yes the Heil is different and yet i find many of the great things i love so dearly about to-end ribbons to translate to the Adam A5. It is also obvious by the music i tend to gravitate towards when reviewing a product that is quite telling. Right out of the box the A5 monitors were impressive. After about 100 hours i did note the tweeter settled down a bit and the overall sound became more unified. In my setting, the final rear adjustments were +1.5dB for the Tweeter and +3dB for Room EQ <150Hz. Cabling was the Kimber GQ-Mini CU that was fed sound material by my computer's 24-bit/192kHz sound card or the Emmeline Predator (reviewed here). before i forget, one of the 'tricks' in setting up any speaker system, especially nearfield monitors as small difference are a larger percentage versus far-field, is precision in setup. You want everything to be exactly spaced in all dimensions. When first hooking up the Adam A5 the first thing that came to mind was how the sound they produced reminded me a lot like that of all the time i spent in the recording studio. There is a great truthfulness in the way they sound. Unlike, say, either the audioengine models or the fabled LS3/.5 monitors, you do not get slightly boosted midbass so that the music sounds fuller than it truly is. While this may be a asset with the audioengine 2 so as not to sound anemic, it is a neat trick to fool the ear into thinking there is more 'there there. The Adam A5 refuses to tell such fibs, instead it produces the lower frequencies down to an honest 55Hz (± 3 dB) and then nearly refuses to give you much than what is truly there within the input signal. If you want more deep bass, you'll want to spring for the company's subwoofer module or the like. Then again 55Hz should be more than fulfilling for desktop monitors unless you are a pipe organ freak or into those car audio techno bass songs and such. Even my listing to various Kraftwerk discs was very enjoyable, with only a very rare moment or two of missing out on the very last octave or so. As i said before, that is why Adam and many other companies offer subwoofers for monitor loudspeakers. But enough about the bass, let us climb up the frequency ladder to the all-important midrange. Wow! That about sums it up, yet am sure if i left it there you'd be e-mailing me asking for more information so here it goes. On the London Symphony Orchestra's Nutcracker Suite (Mercury Living Presence 35MM) it was overwhelming enjoyable how well the string, woodwind, and horn sections sound so very convincing. In fact i could easily hear some of the mastering manipulation quite clearly. Each instrument's natural tonality and harmonics were easily discernable. There was virtually none of that "My brain needs to adding a bit more information at the leading edge of the sound". It all simply was there to be heard. Time and again this same sentiment was echoed on other classical music titles both modern and vintage where appropriate and properly recorded. The classic Nat King Cole song "Mona Lisa" is a great test of many things, including a soothing voice and strings. While not a modern 'audiophile' recording, it is quite challenging in its own ways. Same with the song "L-O-V-E". The Adam A5 did an outstanding job at clarity, speed, and in producing what is within the recording. As for a modern recording of vocals, one of my favorites is Lavern Butler's "Isn't It A Pity [Chesky Records]. Her voice comes through with such a stunning 'thereness' that her voice truly captivates the listener. Of course the remainder of the music is also extremely well recorded, as is expected from this great audiophile label. And yes, Nora Jones' "Come Away With Me", a recording that has perhaps become a type of standard to some, is mesmerizing in how well her voice and the supporting musicians come into play. As such, these little monitors sound so direct and straightforward. If you are seeking a more romantic (read: false) portrayal, then other monitors may be more to your liking. It is not that the Adam A5 strips out the sheer delicacy and seduction of this recording, far from it! You get what you put into these little jewels, with extremely little added or taken away. Moving on to the uppermost frequencies, here is where the proprietary Accelerating Ribbon Technology (ART) tweeter shines, and proves itself a justified following among audiophiles and studio engineers alike. My years of enjoying the Infinity loudspeakers, now long gone, and the Magnepan MG 3.6 (reviewed here) has truly made me miss the way such upper frequency devices deliver the goods. On Kraftwerk's The Mix songs "Abzug" and flows into the song "Metal On Metal" are great examples of how these ultra-high frequencies are delivered in comparison to other tweeter technologies. Without any excuse i will admit to loving silk soft-dome tweeters, as the as they generally produce the extremely high frequencies may be a bit foreshortened, yet they do not become irritating as i find with many metal dome types. Have not played with many ceramic tweeters to give a full judgment, and yes and all generalizations will be considered wrong at one particular point or another. So please take my comments here as a generalization that does not apply 100 percent of the time to all such devices. Still, Kraftwerk's music has a staggering speed and transparency in both sound and phase that to my ears seems hard to equal with done types. Why? i simply am not an engineer and am here to present my opinions and experience. As such, my ears tell me that the Adam A5 tweeters are very impressive and confirm why so many audiophiles form a following to ribbon and Heil type devices. Soundstaging ergo imaging you ask. Excellent, as is the rendering of the real or recording engineered fake ambience. At times i do wonder if audiophiles are really to truly hear what is so close to precisely what is within their music. It reminds of of during my early days of home theater, the then King-Of-The-Hill Lexicon CP-1 was mated to a staggering array of Theta digital equipment, conrad-johnson, VTL and Adcom amplification and eight Infinity loudspeakers plus an M+K MX2000 subwoofer. The reason i go into detail here is that during the laserdisc days, the surround sound mastering was such that even movies like Star Wars and the Terminator would become audibly distracting. Why? Because when i could easily hear so much information it was, in turn, easy to hear all the problems of misalignment of the voice to the video, the artificialness of the voice tracks, the fake acoustics they tried to wrap around the voice, etc. In one movie the main voice track would begin a millisecond or so ahead of the actor, and by the end of the disc the sound was a millisecond or two behind! There were other anomalies, as the movie's sound engineer had to deal with 64+ tracks of audio and attempted to somehow make it all 'work'. ARGH! While i have no major critics of the Adam, i will say to avoid using the Stereo Link feature, as the addition this element seems to diminish the clarity and the imaging suffers (plus at very low volumes the Stereo Link does not work well, with one speaker basically not making any sound whatsoever). A minor point is that microdynamics are a bit compressed, though overall the dynamics and hearing many instruments within the mix is very impressive. On one end i can hear amazing small details and layer after layer of various instruments within a song and/or classical piece. It is amazing to hear very small things far quieter in volume than the main or solo instrument or vocal. On the other end is the lack of the super small dynamic shadings. Color me perplexed how this is so, yet that is what my ears are telling me. At the 2008 Munich High End show i heard Adam's larger offerings and detected no problems with dynamics in any sense. In fact the music was so impressive i sought out to review the A5 and hope to review one of the company's larger siblings at some point in the future. Oh, and you PRAT lovers will be very pleased that all my funky music did indeed dance and swing. So Is This Speaker For You?